2. अभियांत्रिकी/रेल्वे प्रकल्प विभागासाठी ई-निविदा मागवण्याच्या जाहीर सूचनेनुसार निविदाकारांसाठी पात्रतेचे निकष आणि सामान्य तत्वे . Description: Supply of Super Troving Raymond Fine Fabric / Other Branded Fabric for Peon, Mukadam, Sweeper & Cleaner Staff. Description: Supply of Super Troving Raymond Fine Fabric / Other Branded Fabric for Security Staff. Description: Supply of Super Troving Raymond Fine Fabric / Other Branded Fabric for Mali, Mazdoor, Helper, Helper (T) & Meter Reader Staff. Description: Supply of Bata / Other Brand Sandal for Female Mali, Mazdoor, Sweeper Staff. Description: Supply Of Uniform articles for security staff and class IV Employee. 2 Ref:CA No: OllCIDCO/T&C/CTCPITE(NMIA)/2018-19(E- TenderNo.2891) CORRIGENDUMNO.1 Request for Proposal for Economic Planning and Strategy Development for Commercialization of Land Parcels of CIDCO. 3 23/CIDCO/EE(ELECT-HSG)/2018-19 Providing Street Lighting on Balance Roads in Taloja Ph-II, Navi Mumbai. 4 C.A. No. 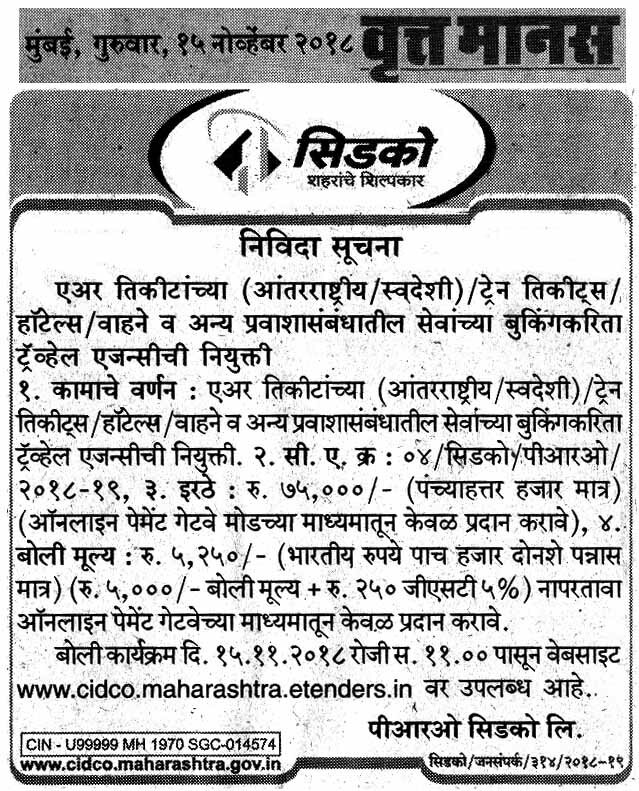 : 16 /CIDCO/EE(ELECT - HSG)/2018 - 19 Operation, Maintenance & Repairs of Electrical Installations at CIDCO Nodal Site Office, Fire Station, Community Centre at Kalamboli Node. 5 02/CIDCO/EE(Design)/2018-19 Purchase of Structural Design soft ware ETABS & SAFE. 8 15/CIDCO/EE(ELECT-HSG)/2018-19 Name of Work	Providing area lighting arrangement for Joggers Track in play ground at Sector-01 and water pond in Sector 12 at Kalamboli, Navi Mumbai. 10 CA No. : 01/CIDCO/T&C/STE (MRTS&SP)/TE(SP)/2018-19 Operation of Pay & Park System at Seawoods Railway Station Forecourt Area. 11 C.A.No. 01/CIDCO/T&C/STE(MRTS&SP)/TE(SP)/2018-19 Operation of Pay & Park system at Seawoods Railway Station forecourt area. 12 C.A.No. :07/CIDCO/EE(ELECT-HSG)/2018-19 Providing temporary lighting arrangement around the immersion pond during Ganesh festival, Gauri Ganpati, Durga Festival & Chhat Puja Festival at New Panvel. 13 C.A.No.08/CIDCO/EE(ELECT-HSG)/2018-19 Providing temporary lighting arrangement around the immersion pond during Ganesh festival, Gauri Ganpati, Durga Festival & Chhat Puja Festival at Kalamboli, Kamothe and Taloja Ph-I & Navade Ph-II. 14 C.A. No. 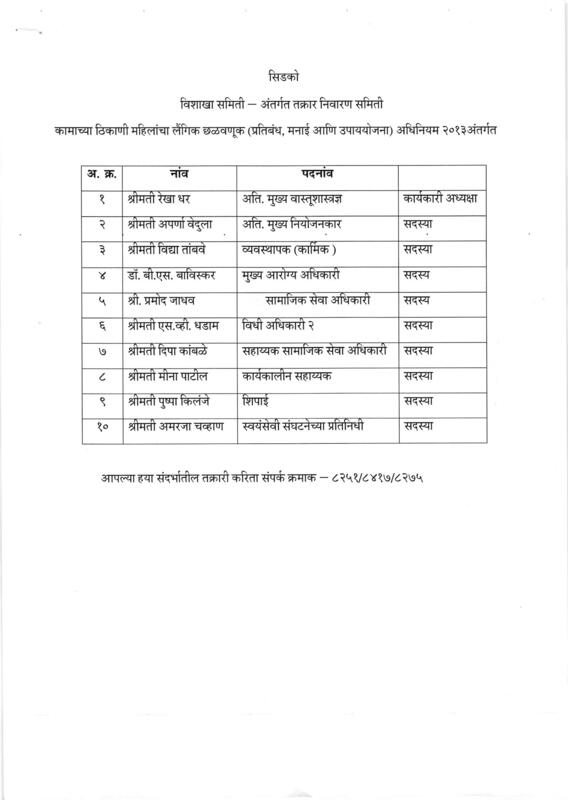 : 04/CIDCO/EE(Palghar-II)/SE(Palghar)/2018-19 Construction of Govt. Guest House including Civil, Electrical & Mechanical, HVAC, Landscaping & on-Site infrastructure works in Sector-17 at Palghar New Town, District Palghar. 16 C.A. No. 09/CIDCO/SE(KK & N)/EE(KHR-II)/2017-18 Providing and laying balance water supply line in Sector 35 at Kharghar, Navi Mumbai. 17 C.A. No. 08/CIDCO/SE(KK & N)/EE(KHR-II)/2017-18 Landscape Development for Butterfly Garden on Plot No.9A in Sector 35F at Kharghar, Navi Mumbai. 18 C.A. No. 07/CIDCO/SE(KK & N)/EE(KHR-II)/2017-18 Providing Reclamation using debris from NMMC area and road embankment for 12.5% scheme in Sector 45 at Khrghar, Navi Mumbai. 19 C.A. No. 01/CIDCO/SE(KK & N)/EE(KHR-II)/2018-19 Integrated Infrastructure development work in Sector 34A at Kharghar, Navi Mumbai.